Despite critics' calls for more scrutiny, federal pipeline regulators say they see no reason to delay activating the Oklahoma-to-Texas leg of the controversial Keystone XL pipeline, which is set to be turned on next week. Time is quickly running out for Texans fighting the southern leg of the Keystone XL pipeline. As its operator prepares to start pumping crude oil underground from Cushing, Okla., to refineries on Texas’ Gulf Coast, citizen activists are calling for more testing of the line, saying that months-old warning letters sent by federal regulators to the pipeline's operator provide reason for concern about the line’s integrity. But the U.S. Pipeline and Hazardous Materials Safety Administration (PHMSA), which regulates interstate pipelines, says it has properly vetted the project and sees no reason to delay the segment, which has been under construction since August 2012. Unlike the hotly contested northern segment of the pipeline, which connects Oklahoma to the tar sands in Alberta, Canada, the southern section didn’t require President Obama's approval because it doesn't cross any international boundaries. On Tuesday, TransCanada, the pipeline’s operator, told The Texas Tribune it is still on pace to start commercial pumping on the southern leg by Jan. 22. With the line's activation looming, pipeline critics are unleashing last-ditch efforts to thwart the project, alleging it is unsafe. In September, PHMSA sent TransCanada two letters warning of “probable violations” related to the construction of the pipeline. One letter, sent on Sept. 10, said the inspectors noticed, among other possible violations, that TransCanada was laying parts of its pipe in rocky terrain, risking dents. And on Sept. 26, regulators criticized the welding procedures on a piece of the pipeline, saying the company did not use qualified welders. “From the start of welding, TransCanada experienced a high weld rejection rate,” which measures defective welds, the letter said. 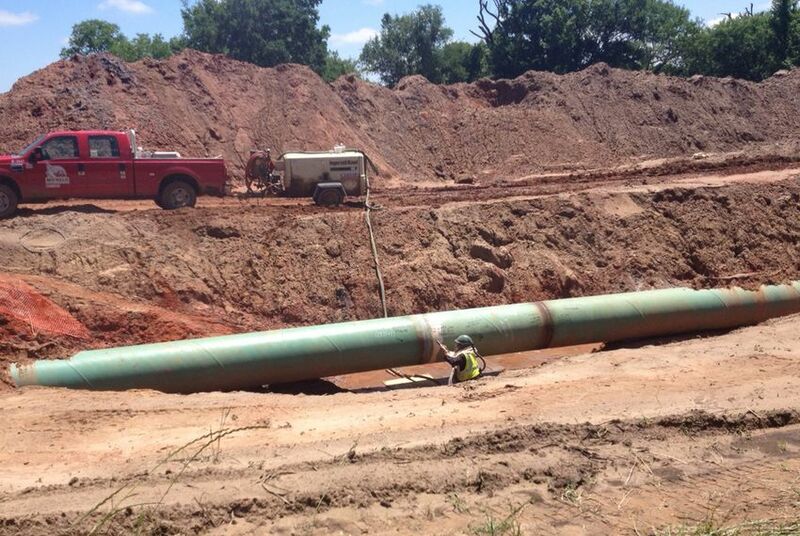 Pipeline experts say sound welding is one of the most crucial aspects of construction. Critics of the pipeline, including the consumer advocacy group Public Citizen, say the letters support their claims that the pipeline is unsafe and needs more scrutiny. “Now the pipeline is being filled, and we have absolutely no idea whether it’s safe,” said Tom “Smitty” Smith, the group’s Texas director. In November, the group released a study saying it had documented more than 100 potential construction problems — related to welds, dents and coating — across a 250-mile stretch of the pipeline. Smith said the PHMSA letters “affirmed, gave depth to and quantified” the problems his group said it documented. PHMSA, however, said that it had worked with TransCanada to address the issues, and that it will not slow down the project based on current information. In the months since issuing the letter, PHMSA, which spent a total of more than 150 days inspecting the construction, has pored over TransCanada’s records and any testing data — an action that typically follow such warnings, Hill said. Data shows that TransCanda has addressed the issues and went beyond requirements in responding to concerns, he added. “We don’t ask the operator to dig up any pipe when we issue warnings,” Hill said. Public Citizen, which met with PHMSA officials in Houston last week and said it received similar responses, criticized the agency’s process, saying it relies too heavily on company information, essentially taking the industry at its word. Smith said PHMSA should require TransCanada to perform another round of inline caliper testing across the pipe — the method used to measure dents, wrinkles and other issues. “The question becomes, why wouldn’t you trust the quality of the same tools used to detect the original problems?” Smith said. TransCanada, meanwhile, says it has gone out of its way to build safely, and that it already identified and addressed many of the issues raised by Public Citizen. TransCanada has also criticized Public Citizen’s study, which was not peer-reviewed. Keystone XL is not the only major pipeline drawing concerns among Texas landowners and environmentalists. Some, for instance, have called for the permanent shutdown of the Pegasus pipeline, which ruptured in March, sending into the streets of Mayflower, Ark., at least 210,000 gallons of thick crude destined for Nederland, Texas. In November, PHMSA proposed a $2.6 million fine for ExxonMobil, the pipeline’s operator. But compared with train and truck traffic, pipelines are generally seen as the safest way to transport fuel. Rail transport has drawn increasing scrutiny, following a series of high-profile derailments and explosions, including a July blast in Quebec that killed 47 people, and December's fiery explosion in North Dakota that prompted a small town to evacuate.